Disagreement between the U.S. and Russia, the difficulty of cleaning up chemical weapons in a war zone, and other reasons Damascus's latest promise might not be fulfilled. Foreign-policy watchers may have experienced a collective case of whiplash today when, as the threat of punitive U.S. strikes neared, the Syrian government appeared to accept a plan to contain and destroy its chemical weapons and to sign a convention against using them. 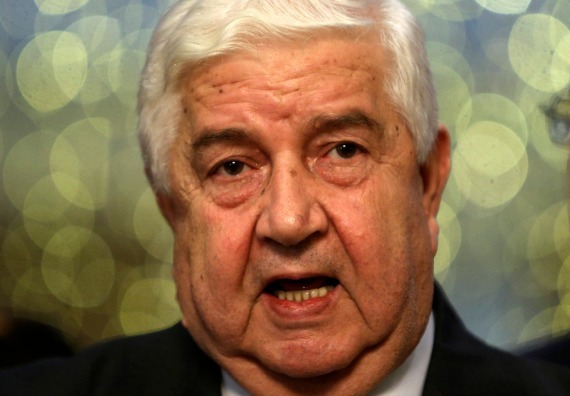 Foreign Minister Walid al-Moallem told Lebanon's Al-Mayadeen TV that Syria would place it chemical weapons locations in the hands of representatives of Russia, "other countries" and the United Nations. He promised that his country would also declare the chemical arsenal it long denied having, stop producing such weapons and sign conventions against them. Though this seems on the surface like good news -- and it might end up being just that -- experts say massive obstacles remain in Western nations’ attempt to curtail Assad’s chemical weapons use. 1) It’s going to be really hard to find and destroy all of the weapons. Back in the 1990s, we had an agreement, we had leverage, and we had a U.N. team that went around Iraq in search of weapons of mass destruction. But still, Saddam impeded the monitors. He lied and cheated. He played a shell game — moving stuff out the back door of warehouses while the inspectors were pounding on the front door to come in. All the while, in the United Nations, the Russians played lawyer for the defendant. This time, it might be even harder, since there’s an active civil war going on, Assad hasn’t shown himself to be a willing partner at any other point in the conflict, and he hasn’t even admitted to having chemical weapons. “How do you go about in a combat zone accounting for the chemical weapons program, conducting on-site destruction, and removing the stuff when combat is swirling around?” Michael Eisenstadt, director of the Military and Security Studies Program at the Washington Institute for Near East Policy, told me. 2) The international community still disagrees on what to do about Syria. Earlier today, Russia rejected a French plan for destroying Syrian chemical weapons because it had an enforcement mechanism. Throughout the crisis, Russia and China have obstructed all U.S. efforts to take action against Assad. Putin also reiterated today that the plan to bring Syria’s chemical weapons under international control will only go forward if the U.S. rules out the use of force, just days after U.S. officials were lobbying Congress for authorization to pursue a strike on Syrian military targets. Finding and collecting chemical weapons will require a large, cohesive international effort, but the UN Security Council has disagreed sharply on how to handle Syria so far. In order for the proposal to go through, Russia might demand the U.S. stop arming the Syrian rebels, for example, something the Obama administration is not likely to agree to. 3) Assad will still have conventional weapons at his disposal, and he’s going to continue using them on civilians. Astonishing to think that the world is not discussing -- at all -- Assad's slaughter, with conventional weapons, of his fellow citizens. In fact, just after the announcement that Syria agreed to the chemical weapons ban, Brookings’ Doran tweeted a story about Putin shipping Assad additional conventional weapons to help him prevail over the rebels.